Published Aug 17, 2011 by Que. Part of the Essentials (Video Training) series. This lesson will help the viewer decide which model iPad 2 to purchase, and then walks them through the initial set-up procedure. It also demonstrated how to hold and interact with the iPad 2 using on-screen finger movements and the tablet’s virtual keyboard. Once someone gets their iPad 2 up and running, this lesson shows them how to customize the various settings on their tablet. Demonstrations of how to move around app icons on the Home Screen, set up the tablet’s passcode feature, and customize the Lock Screen and Home Screen’s wallpaper are included. 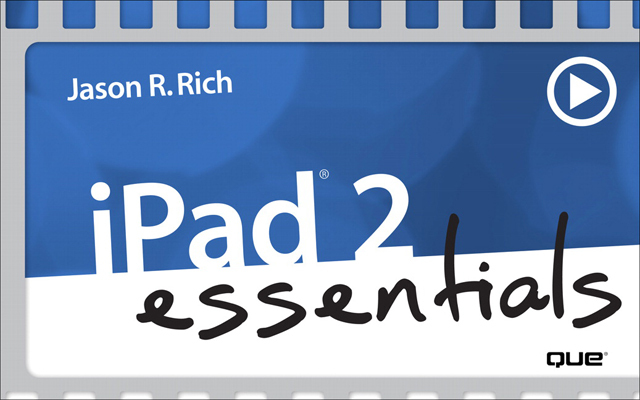 This lesson showcases and explains how to use some of the iPad 2’s core, pre-installed apps, such as Notes and Maps, plus demonstrates a few other “must have” apps available from the App Store. Discover how to participate in real-time video conferencing on the iPad 2 using the FaceTime app, plus how to use the two cameras that are built into the tablet. This lesson also offers a tutorial for using the Photos and Photo Booth app, as well as the optional iMovie and Photogene apps. Learn how to find, purchase, download and install new apps from the App Store, plus use Apple’s iBookstore to find, purchase and download eBooks. In addition to explaining how to use the App Store app, this lesson offers a tutorial for the iBooks app and the iBookstore service. If you’re a businessperson, entrepreneur, freelancer or consultant, for example, this lesson will introduce you to a handful of “must have” business-oriented apps for the iPad 2, including Pages, Numbers and Keynote, along with other third-party apps available from the App Store. Viewers will also learn about specialized travel apps, as well as news apps, for example. This lesson also covers how to use an AirPrint-compatible printer with the iPad 2 in order to print wirelessly from the tablet. While the iPad 2 can be a powerful business, productivity, communications and organizational tool, it is also an extremely powerful, multi-purpose entertainment device. From this lesson, learn how to use the iPad 2 to play games, listen to music, watch videos (including TV show episodes and movies), and stream audio and video content from the web. Discover how to transfer and sync information, data, apps and other content between the iPad 2 and a primary computer (a PC or Mac) using the iTunes sync process. This lesson also explains how to update the iPad 2’s iOS software, and maintain a reliable backup of the tablet’s data. In just over four hours of video, you will learn how to set up your iPad 2 and start using it quickly, without sifting through a lot of technical jargon. Not only is everything is explained in plain English, but you can see exactly what is being done each step of the way. Learn how to customize settings, establish network connections to wi-fi networks, use iPad 2's core applications, as well as how to purchase, download and use applications that you can find in the Apple App Store. Find out how to manage your content using iTunes, use apps for productivity and entertainment, and browse the internet, send and receive email, and more. Use the built-in cameras for things like video conferencing using FaceTIme, or use the Photo Booth, Photo, or iMovie apps to capture and edit your photography and video recordings. All of this and more is shown in this easy to follow and understand video format.